As a former employee, I watch job openings at City Hall with great interest. I have noticed something lately, however, that has caused some concern and – in my opinion – sets the city up for potential litigation. 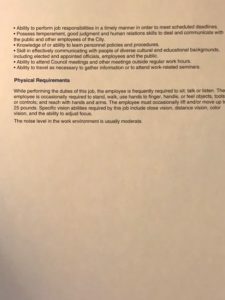 I have copies of two recent job postings, but there are several that I want to talk about here. 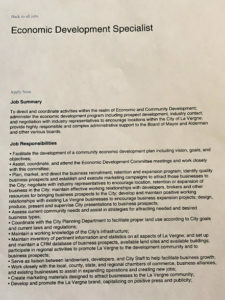 For background, when I worked for the city my job was comprised of three main functions: city recorder duties, public relations, and economic development. I earned additional designations from the Department of Homeland Security and the State of Tennessee to go along with my college degree. Upon my departure, those three functions were divided essentially into three jobs – the most recent was the creation of the economic development specialist position several months ago. 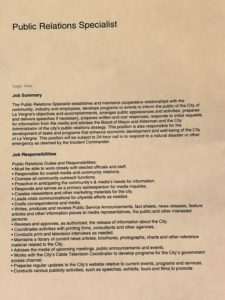 The city’s public relations specialist recently resigned as well, so we can easily compare those two positions side-by-side. 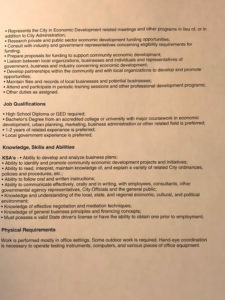 Here are photos of the job descriptions … pay attention to the education requirements. The PR Specialist job was listed at about $24 per hour or almost $50,000 per year for a 40-hour work week. It requires a college degree and much experience. The ED specialist position was salaried at approximately $56-57,000 per year and only required a high school diploma. The Court Clerk position was also recently available. It too required a college degree for a salary in the $30,000’s. 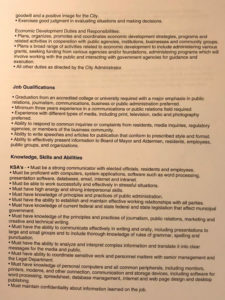 The assistant city recorder position also requires a college degree and pays in the $30-40,000’s. The grant writer position demands a college degree and pays in the $30s. Essentially a lesser degree was required for a higher paying job. The economic development job went to a former alderman who I’m certain is uniquely talented and will do great work. This is absolutely NO reflection on him because I’m sure he’ll bring LaVergne more retail! However, the lower paying jobs required more education which would be indicative of greater skills needed. Frankly, that’s very unbalanced. And it seems to be a violation of the equal pay act. I hope the Board of Mayor and Aldermen are paying attention to this. I would encourage you to both fix this broken system that could lead to litigation and take a long, hard look at the professionals who are required to have college degrees, but are unequally paid in violation of the equal pay act. "Employment Requirements at City Hall are Concerning", 5 out of 5 based on 1 ratings.